Thinking About Adding a Cat or Dog to Your Family? Thinking about adding a cat or dog to your family? Head to the third annual Paws and Pages Pet Expo. Are you in the market to buy your first home? Your financial responsibility will be more than just a mortgage payment, so be prepared. Looking to update or freshen up your decor? Why not consider adding some antiques to your mix? Selling Your Home? Don't Forget About Curb Appeal! Getting ready to sell your home? What it looks like from the outside can entice or turn off potential buyers. 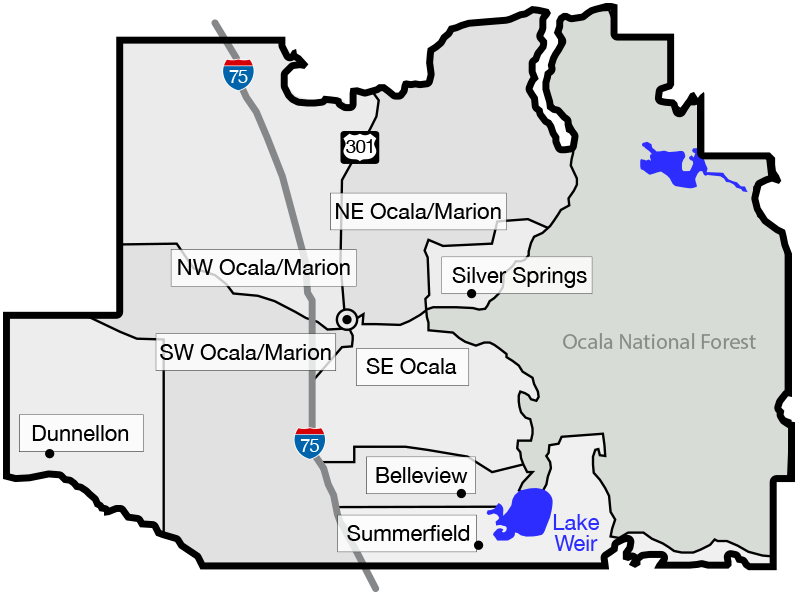 With three branches in Ocala, the Marion County Public Library System provides convenient access to a wealth of information and services. Horse lovers rejoice! The grand opening date for the World Equestrian Center's new Ocala facility is January 2021. In 2019, resolve to dine at more privately-owned and operated local restaurants than chains. Enjoying your favorite seasonal coffee shop beverage when taking a break from the hustle and bustle doesn't have to result in weight gain! Try one or more of these tweaks to cut some calories during the holidays. Humidity is a way of life here in Florida. Here are some tips to combat fungus & mold in your home. Is Marion County bucking the national slowdown trend? Many areas around the country are reporting major real estate slowdowns. Despite low inventory, homes are staying on the market longer because there are fewer willing & able buyers out looking for homes. But is that trend also happening here in Ocala? Halloween is approaching! Come out with family and friends to these fun and spooky events happening near you! With autumn in full swing, there are so many things to do in Ocala. Check out the fun events we picked out for this fall. Oh summer. What a wonderful season full of adventure, relaxation, and new experiences. With the end of summer nearing, we wanted to compile our top three choices for things to do in Ocala, a sort of “last hurrah,” if you will. Summer, we will miss you dearly. Fall is here and the kids are back in school. Maybe eventually we will have some cooler weather, but being Florida it could be 95 for Thanksgiving. However, fall does mean that the Ocala/Marion County area has lots of fun fall activities. Epic Theatre's plan to build big 12 screen movie theatre near the Heathbrooke is a bit closer. Help lick the heat this summer with a cool treat at a local Ocala ice cream stop. There are several to chose from and you won't have to travel far to find a good spot. Publix has dominated the grocery market for years in the state of Florida but nationwide giant Kroger may have something to say about that. Having recently purchased a shopping center in Florida, we may see the competition start to grow as Kroger looks for a hold on the market. Funding has been approved for the development of the new 'Cross Florida Commerce Park' that is in the works. Marion County has pledged to match the $5.5 million from the state with another $6 million. Projections see the park having a massive impact on the surrounding area, providing a major source of much needed job availability. Yet another ‘Roadhouse’ style restaurant is coming to Ocala. The market for restaurants that allow you to throw your peanut shells on the ground just got a little more competitive.